If you’ve spent your life being really busy with a career, raising a family, or both, you may not have had time for one of life’s true pleasures: owning a pet. Now that you have retired and have more time, there are some major reasons to consider getting a dog, cat, or other community approved pet, especially if you live alone. In fact, a recent study shows that people who own a dog and live by themselves actually live up to 33% longer and decrease their chance of a cardiovascular related death by 36%. While that might be a big incentive to find a furry friend, it isn’t the only one. When you get a pet, you are entering into a contract of sorts. You will take care of your pet, and it, in its own ways, will take care of you. Knowing that your pet relies on you can be huge motivating factor that propels you through your day by giving you a routine by which you structure your time. If you aren’t normally active, there is no better reason to get some exercise by taking a walk than if your pet needs you to do it in order to be happy. Also, if your children have moved out and have their own busy lives, you may miss taking care of something. While a pet could never replace a child (though 90 percent of Americans do consider their pet to be part of the family) there is an instinctual satisfaction that we get from taking care of an animal. While cats might be easier to take care of than dogs, some dogs make up for it by providing great protection. If you live by yourself or with someone whose health keeps them from moving quickly, dogs can be a great warning if something is amiss outside your home. Some dogs have ferocious barks that can scare away people with bad intentions. In fact, many criminals say that when they evaluate which houses they want to break into, whether or not that house has a dog is one of the largest factors they consider. 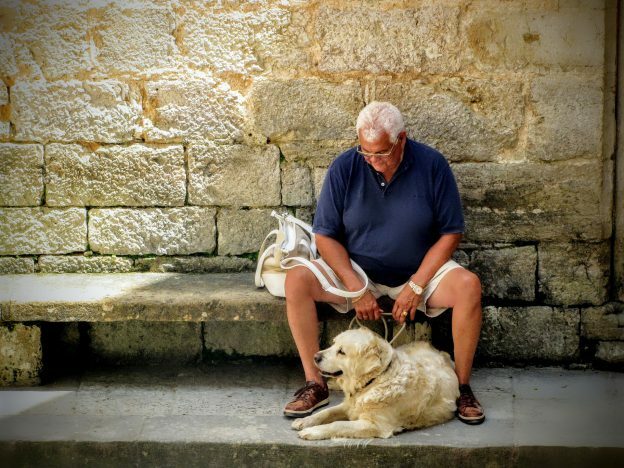 These reasons alone should make it clear that getting a pet is something that can do wonders for your life as a retiree by helping you become more active and by lowering stress. If you think your life will feel a bit more complete with a cat or dog around, don’t forget that there are lots of furry friends available at your local animal shelter. Did you know you can sell all or a portion of a life insurance policy, even term insurance? A life settlement is a great way to help fund your retirement, cross something off your bucket list, or emergency vet bills. To see if you qualify for a life settlement check out our qualification calculator or contact us today! Case Study: Larry and Betty bought life insurance when they were young to protect their children’s future. Now the kids are grown and their youngest is 45 years old, they no longer needed the coverage. Larry’s financial advisor told him he could sell his unwanted life insurance policy for an immediate cash payment. Larry and Betty sold their life insurance policy and used the proceeds to pay off medical bills and supplement their retirement.